You are currently browsing the archives for the Mike Pence category. The players’ efforts are to be political activists who wear football uniforms to their protests. When the NFLPA signed up to do political activism with George Soros, they hoped it wouldn’t get noticed. They tried pretending that they were fighting injustice. Now that they’re exposed, they’re upset when VP Pence gives them a taste of their own medicine. That isn’t systemic oppression. That’s what happens when amateurs try playing politics with the big boys. Stelter opined that this was staged. He might be right, though I couldn’t prove it either way. It’s a little rich, though, to hear NFL political activists complain about staging an event. That’s a case of the pot calling the kettle black. MLB/61 percent favorable to 13 percent unfavorable. NFL/57 percent favorable to 23 percent unfavorable. College football/53 percent favorable to 16 percent unfavorable. College basketball/48 percent favorable to 17 percent unfavorable. NBA/47 percent unfavorable to 23 percent unfavorable. NFL/44 percent favorable to 40 percent unfavorable. If the NFL continues with its protests, they should expect the NFL’s popularity drop some more. They’ve barely scratched the surface. If the NFLPA continues their protests, they’ll be less popular than Harvey Weinstein is with his former company. It’s apparent that Democrats are overplaying the CBO’s report on repealing the ACA. It’s apparent after reading this Washington Post article. The first telling part is when CBO says 18,000,000 “people would lose health insurance in the first year if Republicans move ahead with plans to repeal major portions of the Affordable Care Act without a replacement plan.” That sentence alone nullifies the importance of the CBO’s analysis. That’s because Republicans have consistently said that they’d pass the repeal and replace in the same piece of legislation. They’ve also promised to not let anyone get left hanging while transitioning from Obamacare to the new and improved health care system. It’s clear that the new plan to replace the ACA will be significantly different than anything that’s been used before. Further, Democrats are setting themselves up for failure. The only way that the Democrats’ strategy will work is if Republicans totally drop the ball. The chances of that happening with President Trump, Vice President Pence, HHS Secretary Price, Speaker Ryan and Sen. John Barrasso leading the push is virtually nonexistent. Rest assured that President Trump’s first State of the Union Address will include details of what the replace plan will include. I’d expect that legislation will have been submitted by then. Further, I wouldn’t be surprised if the legislation will gotten its first hearings by then. Once President Trump blasts this information out to the nation, the Democrats’ handwringing and demagoguery will put them in God’s little acre — between a rock and a hard place. If this were done in a vacuum, Weitzner would’ve made a salient point. This isn’t happening in a vacuum, though. This was a stop-gap measure aimed at preventing a single company from leaving. The biggest thing that will incentivize other companies into staying is passing the Trump-Ryan tax simplification legislation. The other biggest thing that will incentivize companies to stay is Trump’s regulatory reforms. What corporate CEO would have their job if they left a nation with low marginal corporate tax rates, a reasonable regulatory environment and a well-trained workforce? That’s a three-legged stool to build a vibrant economy around. That’s a foundation upon which a thriving economy is built. Let’s be clear. The questions Weitzner asked are legitimate questions. If the Trump administration wasn’t intent on tax and regulatory reform, the Carrier deal wouldn’t be getting positive reviews. That’s why it’s important to look at this deal in its totality. It’s worth noting that companies will return to the US the minute it looks like President Trump’s tax and regulatory plans are becoming reality. Finally, imagine a company CEO getting a call from President Trump telling them that their company would get hit with expensive tariffs if they left the US. I can’t imagine that being a pleasant conversation. This is my first post since getting out of the hospital today but it isn’t the first chance I’ve had to talk about the Pence-Kaine. It’s indisputable that Hillary is leading in most of the polls. What’s disputable, though, is whether Mrs. Clinton’s lead is that solid. If Donald Trump takes the fight to Hillary on the economy and how the Obama economy is built on how well-connected people are, he’ll win this election. Mrs. Clinton and Sen. Kaine can’t point to the pathetic economic growth as proof that they’re on the right side of that issue. Sen. Kaine’s first attempt to make a first impression fell flat. It’s long past time to worry about Mrs. Clinton’s first impression on the nation. Saying that she’s a polarizing figure is understatement. Will GOP keep US Senate? One of the things that hasn’t drawn much conversation this month is whether Republicans will maintain their majority in the US Senate. At the start of the year, it looked like Sen. Schumer would be the next majority leader. While that’s still a possibility, it’s looking more like an uphill fight at this point. Josh Kraushaar’s article illustrates why things aren’t turning in the Democrats’ direction. A re­spec­ted WTHR/Howey poll re­leased Fri­day showed Bayh with a four-point lead, down from sev­en points in a Mon­mouth poll a month ago and a far cry from the double-di­git lead he re­cently held in Demo­crat­ic sur­veys. He’s only polling at 44 per­cent, des­pite near-uni­ver­sal name iden­ti­fic­a­tion. If Re­pub­lic­ans can keep chip­ping away at Bayh’s lead with car­pet­bag­ger at­tack lines, it would give them a des­per­ately-needed life­line in their bid to save their Sen­ate ma­jor­ity. 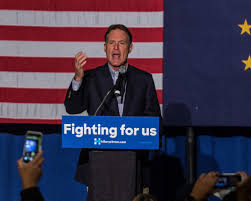 The fact that Bayh is “only polling at 44%” is rather striking. The Sen­ate Lead­er­ship Fund is spend­ing $4 mil­lion in ads over the next month to re­mind voters of Bayh’s checkered re­cord. Des­pite Bayh’s huge war chest, Re­pub­lic­an groups are keep­ing pace on the air­waves, ac­cord­ing to a Demo­crat­ic source. I’ve been skeptical of the Democrats retaking the majority in the Senate. This article doesn’t give me a reason to rethink my opinion. Polite people are saying that Tim Kaine is a perfect running mate for Hillary, then adding that he’s definitely qualified to be president if, God forbid, anything happened to Hillary. After reading this article, it’s painfully obvious that he’s nothing more than a mouthpiece who reads spin-script well but couldn’t think his way out of a wet paper bag. Second, saying that Hillary’s speech was “morning in America” is proof that Democrats haven’t told the truth. ISIS is killing people in France, California and Orlando. Sen. Kaine, does that sound like “morning in America”? Police officers are getting shot in Dallas and Baton Rouge. Does that sound like morning in America, Sen. Kaine? The governor of Minnesota, who addressed the Convention, accused police officers of racism, saying that Philando Castile would probably still be alive if he was white. Sen. Kaine, is it morning in America when governors accuse Hispanic police officers of racism? Terrorist attacks are happening in western Europe at a faster rate than ever before. Ditto within the United States, though not at as fast a rate as in western Europe. What part of that sounds like morning in America, Sen. Kaine? I get it that Hillary thinks it’s morning in America. I get it that Sen. Kaine does, too. They’re both living around the Capitol, where everything is going beautifully. Living near DC, which hasn’t experienced the Obama economy, it’s easy to believe that life is fine. Beyond the Potomac, something that Mrs. Clinton and Sen. Kaine aren’t familiar with, things aren’t going nearly that well. Living near the White House explains why they think it’s morning in America. We don’t need a president that’s unfamiliar with flyover country’s hardships. We need someone who understands what people living in the Heartland are dealing with. Yesterday Minnesota’s governor, Mark Dayton, joined the chorus of denunciation: “‘I abhor the actions taken by the Legislature and governor of Indiana,’ Dayton told the Star Tribune.” Dayton, like a number of other governors, says he is considering a ban on official travel to Indiana. So Minnesota’s bureaucrats may no longer be able to take junkets to Terre Haute. The hysterical reaction to Indiana’s law can only be described as insane. As we noted here, there is a federal RFRA that governs federal laws, 19 states have their own RFRAs, and ten other states have adopted the “strict scrutiny” standard of the Indiana statute by judicial opinion. Governor Dayton is perhaps unaware that Minnesota is one of those ten states. Hill-Murray Fed’n of Teachers v. Hill-Murray High School, 487 N.W.2d 857, 865 (Minn. 1992); State v. Hershberger, 462 N.W.2d 393, 398 (Minn. 1990). The Indiana law is substantially identical to the Religious Freedom Restoration Act, passed by Congress by a near-unanimous vote in 1993 and signed with brio by Bill Clinton. It was a response to a Supreme Court decision upholding an Oregon drug law against members of the Native American Church who had claimed their religion requires drug use. RFRA sets up a balancing test, to be employed by courts. Government cannot enforce a statute requiring people to violate their religious convictions unless it can demonstrate a compelling interest in doing so, and proceeds to do so by the least restrictive means possible. This is in line with longstanding American tradition. The First Amendment, ratified in 1790, guaranteed Americans the “free exercise” of religion. The Framers knew that their new republic included Quakers, Jews, Catholics, Protestants, atheists, even perhaps a few Muslims. They wanted all to be free to live, not just worship, but live, according to their beliefs. There’s little doubt that this week’s firestorm is purely political. These LGBT organizations know the laws on the books, though I can’t say the same about Gov. Dayton. As Barone says, RFRAs impose “a balancing test” for the judiciary to follow in determining whether the government can limit a person’s right to live out their religious beliefs. What RFRAs do, too, is tell government that they must use the least most intrusive remedy if they can demonstrate a “compelling interest” in limiting a person’s right to practice their religion. This isn’t new. As Mr. Barone highlights, this “is in line with longstanding American tradition.” I’d hope that the judiciary wouldn’t take a sledgehammer to people’s religious rights. Apparently, that’s the remedy these LGBT activists want.